Swansea moved out of the Premier League relegation zone as Fernando Llorente's first-half header gave them a precious 1-0 victory over Everton. Llorente's 13th goal of the season saw Swansea leapfrog Hull into 17th place, the Tigers punished for their earlier home defeat to already relegated Sunderland. Swansea are now one point above Hull and firmly in charge of their own destiny with two games of the season remaining. 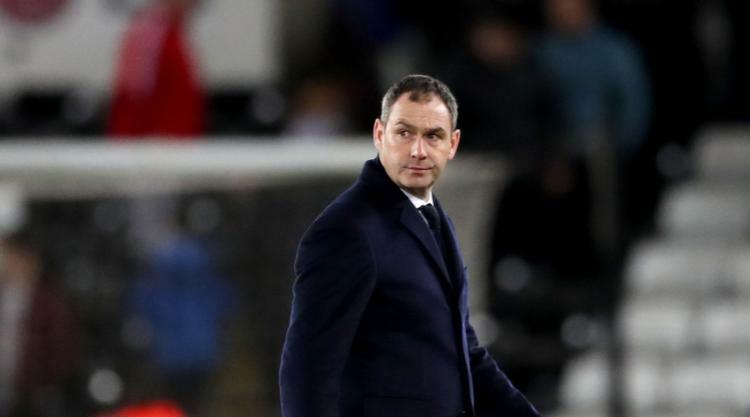 Everton might have had little to play for as they have already qualified for the Europa League but Swansea had to defend for their lives at times, especially in the closing stages as Paul Clement's side clung on. The mood at the Liberty Stadium had been lifted by kick-off as news of Hull's shock defeat filtered down to south Wales. But it was Everton who created the first opening inside 45 seconds as Romelu Lukaku headed straight at Lukasz Fabianski. It was tight and tense with so much at stake for Swansea, the midfield was packed full of bodies and chances were at a premium. Everton shaded possession but did little with it, and Lukaku was admonished by his captain Phil Jagielka on one occasion for losing the ball carelessly. Swansea were too hurried in the final third but demanded a penalty when Gylfi Sigurdsson tumbled in the area. They might have been left to stew on referee Martin Atkinson's refusal to point to the spot, but Swansea were ahead inside 60 seconds when the hard-running Jordan Ayew worked some space on the left. Gareth Barry failed to cut out Ayew's cross and Llorente rose above Jagielka at the far post to send the Liberty Stadium into a frenzy. The lead was almost doubled four minutes later as Sigurdsson's centre found Alfie Mawson and the goal-scoring defender was only foiled by a desperate block from Mason Holgate. Swansea now had a definite spring in their step and Ayew and Martin Olsson combined well to create a shooting opportunity which Barry diverted for a corner. Everton sent on Ross Barkley at half-time to find some inspiration and Swansea had to survive some anxious moments. But the lead was almost doubled after 54 minutes when Sigurdsson drove his mis-hit shot into a crowded area. The ball struck Mawson and fell to Ayew, who smashed it on to the outside of an Everton post. Lukaku's low shot was held by Fabianski, but Swansea threatened whenever Sigurdsson stood over a corner. From one such set-piece Federico Fernandez's goalbound header hit the shoulder of Barkley and ballooned to safety, then Llorente met the next one to stretch Maarten Stekelenburg on his goal-line. Swansea almost settled the contest through substitute Leroy Fer's first touch but Stekelenburg blocked his close-range effort with his legs. Everton piled on the pressure in the final minutes, but they drew a blank for three successive league games for the first time since April 2006 as Swansea held on.